but this has little award potential itself. Diane Keaton plays Emily Walters, an American widow who lives in a Hampstead apartment block, works in a charity shop and spends her time with friends she doesn't really like, led by Lesley Manville's busybody Fiona. Although her grown-up son Philip (James Norton) is concerned about his mother's dwindling finances, Emily prefers to stick her head in the sand. Everything changes, though, when she looks out of her window and spies a mature man bathing in a pond on Hampstead Heath. The bearded fellow is the rather taciturn Donald Horner (Brendan Gleeson), who lives in a small shack in a secreted part of the Heath. Intrigued, she tracks him down and gradually prizes open this clam-like social outsider. Unsurprisingly, amid some gentle humour, romance blossoms between these two, but Hampstead is about more than just later-life love. Loosely based on the real travails of Harry Hallowes, it sees developers attempt to oust Donald from his home, by any means necessary. There are legal shenanigans as Gleeson's grump gets his day in court, while Emily faces her own cross-examination from her so-called friends, who are scandalised by her liaison with the town tramp. Keaton thrives here in pure ditz mode, and her chemistry with Gleeson is appealing. Will it change your life? No. But if you're in the market for undemanding storytelling, it's funny and watchable enough. General release from Fri 23 Jun. 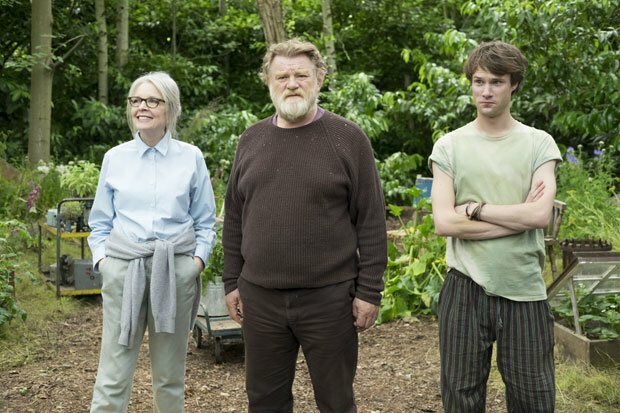 Emily (Keaton) is an American widow living in Hampstead who falls for the grumpy Donald (Gleeson), who lives in a shack on Hampstead Heath. Twee later-life rom-com with Keaton in pure ditz mode; her and Gleeson’s chemistry is appealing, but there are no surprises.